The Moddoolar Triad is a custom designed tailcap for use with 1″ flashlight bodies such as those from SureFire and Moddoolar. Named in part for the three distinctive lobes at the end of the tailcap, the Triad is CNC machined from solid aluminum and has a hard-anodized finish applied in either a natural (gray) or matte black finish. Available as a complete tailcap, with switch already installed, the Triad may also be purchased as a bare tailcap for use with any user supplied Z41 compatible switch mechanism. 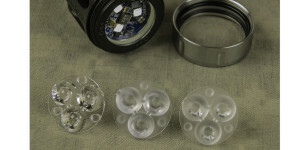 Additional options include a pocket clip and machined slots for tritium vials. A sample of the Moddoolar Triad with black finish and optional belt clip was provided by OVEREADY for the duration of this review. Note: The clip shown in this review is the older “belt clip” version which is no longer available. Current clips are sized for pocket carry and are slightly shorter. Pricing for the Moddoolar Triad tailcap varies according to the options chosen. The Triad has a sleek matte black appearance with smoothly rounded edges. The anodized finish extends throughout the tailcap, including the inner threads where the switch mechanism normally resides. Pocket clip versions of the tailcap have two threaded holes that allow the clip to be secured with a pair of Torx screws. The switch mechanism can be easily changed from one to another with nothing more than simple hand tools. A more complete description of each type of switch can be found in the SureFire Z41 Switch Upgrades article here on FlashlightGuide. 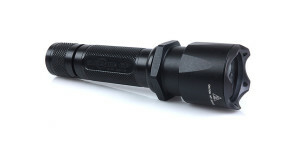 The Triad Tailcap can be used with any flashlight that is compatible with the SureFire Z41 tailcap. Regardless of which type of switch is installed, the raised lobes of the Triad extend far enough beyond the switch boot to allow the flashlight to tail stand. 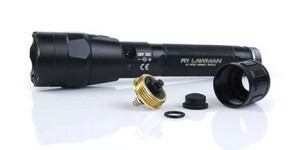 The lobes are also wider than the flashlight body to help improve grip and make the flashlight more resistant to rolling. The broad side openings still permit easy thumb access for switch activation. 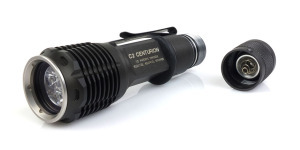 The Triad matches the body diameter of 1″ SureFire lights perfectly. The stainless steel pocket clip (if equipped) only lightly touches the body allowing the tailcap to be installed and removed without scratching the flashlight’s finish. I’ll start by saying the Triad tailcap is just ridiculously nice in both appearance and function. Although it is noticeably larger and heavier than most stock tailcaps, the Triad nicely complements the flashlight without making the light too “tail heavy.” In fact, the extra weight of the Triad can help improve the overall balance of modified lights that utilize heavier aftermarket bezels or LED drop-in modules. The optional stainless steel clip features a distinctive design that both looks good and works well. The clip provides excellent retention when attached to a pocket or belt while its smooth design ensures the light is easy to withdraw or replace as needed. The matte black anodized finish on the review sample was flawless and a very good match for the stock SureFire hard-anodized black finish on lights such as the 6PX, P2X Fury, and P1R Peacekeeper. Of course it also matches perfectly with the hard-anodized black finish on custom OVEREADY hosts. As nice as it looks, the Triad performs just as well. 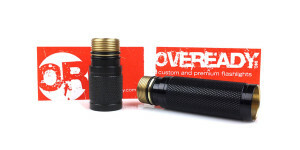 When equipped with a rotary style switch mechanism, such as the SureFire “twisty” or any of the TorchLAB Zero Resistance switches, the enlarged lobes provide additional leverage for rotating the tailcap. The lobes shroud push button switches just enough to reduce the possibility of accidental activation while still permitting easy thumb access. With any type of switch installed the Triad was comfortable to use and fit my hand naturally. So why make such a big deal about a flashlight tailcap? Well, first and foremost, the user interacts with the tailcap and switch mechanism more than any other part of the flashlight. While stock tailcaps may function just fine most of the time, they can introduce limitations with regard to performance, usability, and even aesthetics. With its various configuration options, the Triad tailcap has something for nearly everyone whether they want a sturdy pocket clip, easy conversion from one switch type to another, improved grip, a distinctive appearance, or any combination of these things. 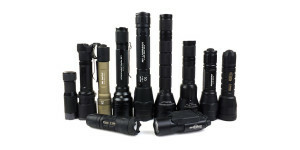 It is certainly pricey but for any fan of SureFire or Moddoolar 1″ diameter flashlights, it could be considered an investment. Posted in Flashlight Accessories, Flashlight Reviews, OVEREADY and tagged Flashlight Upgrades, Moddoolar, OVEREADY, Surefire, TorchLAB.